The PV® MSP1 is a complete microphone and accessory package designed for working musicians on the move. The package includes essential accessories for stage and rehearsal setups, all in a protective gig bag. The PV™ MSP1 features Peavey's performance-ready PV®i 100 dynamic cardioid microphone, which can be switched off when not in use, as well as a fully adjustable, tripod-style boom stand that works equally well with vocals, acoustic guitars, amplifiers, drums or any other instruments. 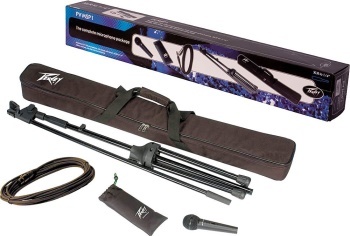 The package also includes an XLR-to-XLR or XLR-to-1/4" cable; a mic stand clip; and a protective nylon mic bag. A durable, zippered gig bag allows users to transport their entire microphone setups from rehearsal to the stage.